A famous gunfighter sits at a bar on a hot afternoon in the middle of Kansas. He reflects silently on a life that has punished him with everything he wished for. Now, he wants company, and he wants to be left alone. He wants silence, and he wants someone to talk to. But not particularly the stranger who steps through the swinging doors of the saloon. 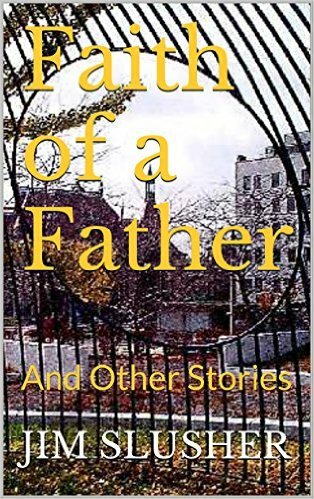 His story, told in full here, is one of a diverse collection of tales in Faith of a Father and Other Stories, available in e-book on amazon.com, including a father’s life-changing confrontation with the meaning of religious faith, a heart-stopping adventure for a mayfly swarm on a country pond, an orphaned teenager’s encounter with justice and more. The famous gunfighter sat at the bar. It was the middle of the afternoon in the middle of the week in a lonely town in the middle of Kansas. He was hot and tired and thirsty. He had money from a poker game, but nothing to spend it on. He did not know where he would go that night, nor even when or how he would leave this tavern. He was as bored as the dusty brown landscape outside. He was dry as the occasional leaf that blew through town in November, and almost as brittle. He was covered with powdery dust, and you could smell his musty horse-sweat scent from three seats away. He was drinking a beer. Though warm, it soothed his throat. He was thinking how he wished he weren’t a gunfighter. He didn’t know farming, but he thought he would enjoy working with his hands. The bartender was staring at the blank wooden wall across the room. The famous gunfighter was the only person in the tavern, so there was not much else to do except listen to the flies buzz around and the wind outside, and wait for your customer’s glass to get low so you could ask him if he wanted some more. Not that he didn’t want to make conversation. He did. Indeed he did. Even way out here in the middle of Kansas and not knowing how to read, you recognized the famous gunfighter. And, Lord knows, he wanted to ask if all the stories he heard were true. But the famous gunfighter obviously didn’t care to talk. He hadn’t responded when the bartender eagerly asked him about that afternoon in Abilene, and he had completely ignored the bartender’s offer to give him his drinks free. The famous gunfighter just stared straight ahead. Sipped his beer and stared. His mind drifted to when he wasn’t famous. As a young man, he just liked guns. He liked the deep-throated song of their explosion and how the music seemed to make his hands, indeed his whole body, hum alive. And, so he played. And after years of toying with that instrument note by profundo note, day after too-short day, an evening would come when, much to his surprise, he would learn what a virtuoso he had become. He did not like to dwell on the memory. It was enough to realize that a man had abused a woman in public and that a young idealist thought he should come to her aid. How could he expect the abuser to challenge him to draw his guns? And, how could he have known before he killed him, that the abuser was himself a famous gunfighter, who, in a silent and immediate death, would bequeath his title to his executioner? Indeed, the young idealist would win more than a title. He also would gain a favored role in a developing folklore thousands of miles east. He would become a model for thousands of would-be famous gunfighters and a symbol of the rugged adventure that awaited any young bank clerk, or carpenter, or railway builder, or just plain out-of-luck sod buster who wanted to foster his manhood in the new West. Not many who read of his exploits in the newspapers and dime novels ever really expected or wanted to meet him. But some did. Some wanted it bad. Bad enough to track him from town to town. And some were just plain happy if he chanced to cross their path. Together they formed a posse mighty enough to chase him like a prize wolf over hill and river and across a desert and back. With each death, his fame expanded. He found himself maestro to an audience he detested but could not escape, an audience that demanded over and over and over and over and over again that he repeat his last song. He sipped his beer. How he wished to find a farm where his face wasn’t known, or wouldn’t be someday. How he wished he didn’t enjoy card playing quite so much. How he wished he weren’t so frozen in this spot by the mere fact that neither north, south, east nor west offered even a single siren note to beckon him. And then there came a call. It sang to him in clear and sonorous and unmistakable tones, and its performer was a now-familiar shadow in the doorway in front of him. He sipped his frothy beer and tried to ignore the tuning up. It was insistent as always. “You didn’t really think you’d get away with this one, did you?” it cooed. “No,” the famous gunfighter said. “You know who that farmer was you killed back in Liberal?” the siren repeated. The caller stepped all the way inside the tavern. He thought how this finally was his chance. He could never have hoped to be so lucky. To be a famous gunfighter had been his only dream, practically from the time he’d been able to dream anything at all and know it. He had spent his life practicing with his revolver. Drawing and shooting. Drawing and shooting. First bottles, then gophers and squirrels. And later, to show off, even coins in the air. All his friends told him he was the best shooter they’d ever seen. And he was. People gasped in awe at his fearful talent, and their timidity fed his courage. Two months back, he had managed to lure two young cowhands into a fight over a Dodge City whore, so now he had tasted death. Then fate had brought the famous gunfighter into his life. He had only to get him to draw. “Your worst nightmare,” he answered. The famous gunfighter had not moved his hand from his beer glass. He rubbed a rough finger across the rim and took time to enjoy the unevenness of the ridges he encountered. He laughed to himself at the caller’s response. The man had no idea how right he was. The famous gunfighter did not move, though the bartender had long since fled from sight. He ran his finger across the ridges of his glass. The caller did not blink or suggest the slightest response. He heard the sound of wings like a giant crow’s flapping in the wind outside and quickly ignored it. The famous gunfighter shook his head back and forth. His nostrils flared with the smell of a steaming plate of chicken and dumplings. His right hand reveled in a slow, energizing stroke across a woman’s trembling stomach. His eyes drank in the splendor of a lake he’d seen only once in upper Nevada. His ears accepted the soothing rattle of the tall pines swaying in an evening breeze high in the Rockies. He straightened his back and faced his accuser squarely. The challenger did not speak. All the famous gunfighter could make out in the silhouetted face was a faint, confident smirk. “This is for my cousin,” the caller sneered. His draw was smooth as ice, and colder still. But it was not smooth, nor cold, enough. The famous gunfighter was lost for a moment in the rush of a powerful barcarole. He felt the music waft through him, then, opening his eyes, noticed that the face of the bartender had returned. It was much whiter now, and its eyes were wide as silver dollars. “You saw I had no choice?” the famous gunfighter asked. The pasty face nodded up and down, its silver-dollar eyes dashing from the living shooter to the dead one, then settling down to follow the famous gunfighter as he stepped over the corpse and strode out of the bar. Within moments, a crowd gathered. They argued for a time, but finally settled on a crew of five to take the body outside and bury it. No one stayed to help the bartender as he washed down the blood stains and tried to scrub them out of his beloved oak floor. One week later, the story reached back to Liberal, carried there like a cockle burr on the blue pantlegs of a farmer on a mission to buy cultivating tools. And, a day after that, the local newspaper sent it dancing, dizzy in its pace and sweet in its reverence, across the wireless back East to The Times.